Biogents AG produces highly efficient traps against tiger mosquitoes. The superior efficiency of Biogents mosquito traps has been scientifically proven. 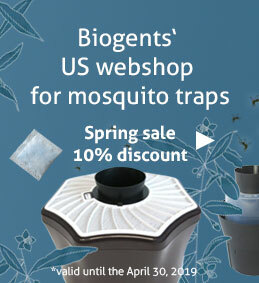 With over 100,000 traps sold, Biogents is the market leader for tiger mosquito traps. Biogents develops and produces highly efficient tiger mosquito traps. Biogents patented mix of artificial skin emanations, the BG-Sweetscent, enhances the attractiveness of mosquito traps for tiger mosquitoes. Biogents is exhibiting at the 85th AMCA annual meeting. We would be glad to have you there while we introduce our new BG-MTS trap. Learn more about our eco-friendly and scientifically-proven mosquito traps and we are happy to answer all of your questions.